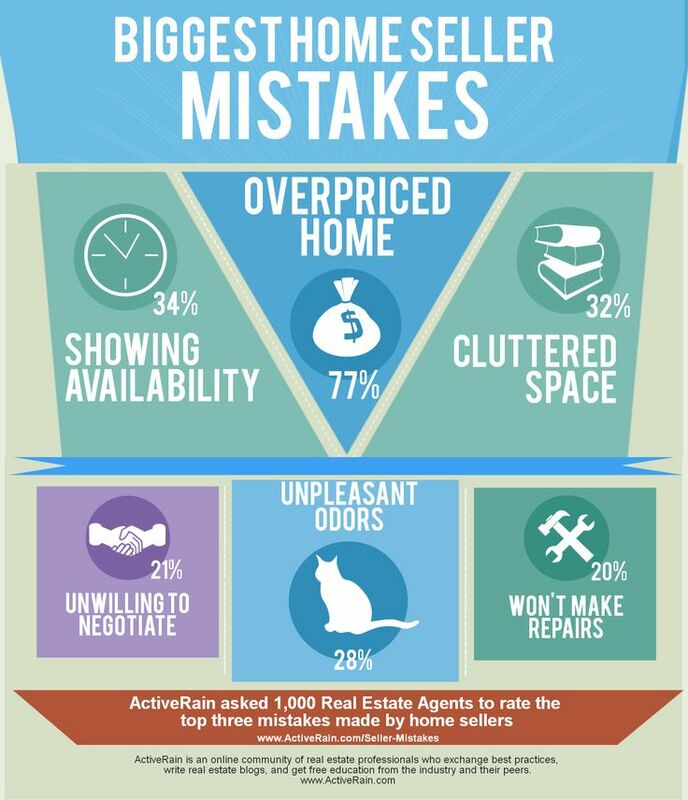 When selling your home there is so much to consider! Take a look over the most common mistakes to avoid. Depending on the market you could get multiple showings a day however, if you are unable to let people in to see it how can a buyer make an offer. Consider this more exposure equals more potential buyers that may make an offer! So get out of the house go to a friends or grab some coffee and let the relators in to show off your home. Hiring a knowledgeable realtor to list your home is key, and trusting there list price is also key. As a homeowner we tend to think our home is worth a lot more then maybe the housing market would dictate. However, a knowledgeable realtor will know exactly what it will sell for and what will attract showings. No showings no offers, no offers your home doesn't sell. This is huge, I like to say you want people to see your home, not your stuff. Your amazing and huge living room could come across as small when cluttered with too much stuff or bulky furniture. A closet bursting at the seams tells a buyer there is not enough space for there stuff. Pack up your unused items and store them away to make your home uncluttered. A simple step with a huge benefit. Sellers will walk away if you are unwilling to negotiate. You don't need to give away the farm, but negotiating something even something small can be huge in getting an accepted offer. You will never get a second chance at a first impression, if you have pets keep them out of the main living space during showings. Consider cleaning the carpets before listing. Pet odor is a huge turn off for buyers, and if they do make an offer they may ask for new carpet if the smell is too unpleasant. Keep your home smelling clean, but neutral nothing harsh. This can be huge, I watched a deal fall apart just this week because the seller refused to make any repairs. When selling your home the buyers will have an inspection done this is to be expected. It's not a matter of giving in to every request, but being willing to negotiate. Your realtor can help navigate the negotiations and let you know what is normal repairs, and what is not.